Mollem National Park of Goa is one of the biggest Goa National Park and perhaps the most popular wildlife sanctuaries in Goa. The national park is spread across an area about 240 sq km (93 sq miles). This place is located at the Sanguem taluk, which is at the Western Ghats of South India. 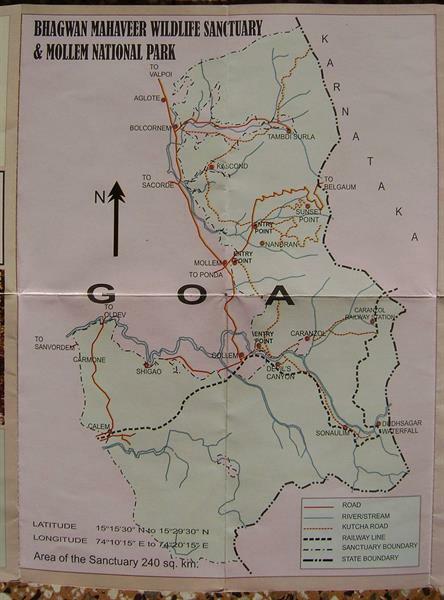 This National Park is spread from Goa to Karnataka. It is located about 58 kms from Panaji, which is the Capital of Goa. There are also many famous tourist attractions situated near this place. Some of the famous tourist attractions near to Mollem National Park are : Dudhsagar Falls and Kadamba Dynasty. This place was known as Mollem Game Sanctuary in the past. This Mollem Game Sanctuary was declared as Bhagwan Mahavir Wildlife Sanctuary in the year 1969 and later it was named as Mollem National Park in the year 1978. 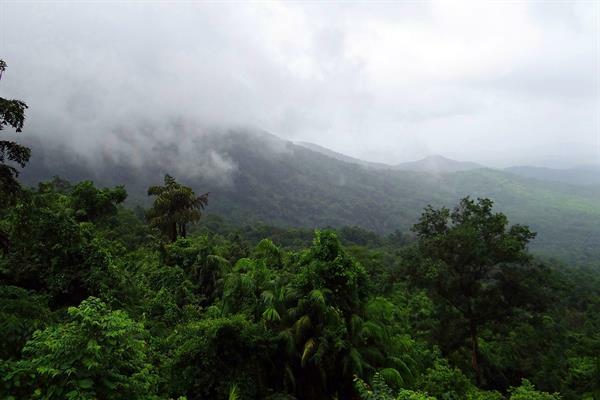 Bhagwan Mahavir Wildlife Sanctuary is one of the famous tourist spot in Goa as it is a dense and ever green forest and the favorite place for the nature lovers. The types of tree species found in Mollem National Park of Goa are Lagerstroemia, Dalbergia, Terminalia, Xylia etc. The mammals found in Bhagwan Mahavir Wildlife Sanctuary and Mollem National Park Goa includes barking deer, Leopard, common langur, flying squirrel, malabar giant squirrel, pangolin, slender loris, spotted deer, wild dog, bengal tiger, bonnet macaque, civet, gaur, mouse deer, porcupine, sambar and wild boar etc. Some of the popular birds found in Mollem National Park are Drongo, Fairy bluebird, Greater Indian hornbill, Malabar pied hornbill, Shrikes, Grey jungle fowl, Large green barbet, Malabar pied hornbill, Sri Lanka Frogmouth, Grey-headed myna and many more. Besides mammals and birds many species of Butterflies are found here. The types of Butterflies found here include Blue Mormon, Lime Butterfly, Southern Birdwing, Common Mime, Crimson Rose, Common Jezebel etc. There are also many species of Snakes found in this forest, which include Indian rock python, Bronzeback Tree Snake, russell's viper, common krait, malabar pit viper, Indian cobra, rat snake, king cobra, hump-nosed pit viper and many more. In the park, you may find cobwebs, different and colorful butterflies and graceful poison-less spiders, and other species if you would like to enjoy those natural creatures and much more on the way to your journey, you may then simply drive and take in views of the alert porcupines, jungle cats, barking deer, civets, flying squirrels and cobras. Since this is a forest area, it is strongly recommended to plan your travel to reach this place well before dark. Make sure you have hotel/reservations for your stay. Travelling without advance booking may help you get the best deals in the hotels, provided there are rooms available. However, I wouldn't recommend a visit to this place without advance hotel booking. You may not want to wandering in the jungle looking for rooms. If you are looking for a resort kind of stay in the jungle, look at jungle resorts like "Dudhsagar Spa Resort". If you like to plan your visit to Mollem National Park, you can contact the Range Forest Officer of the park on the phone number 0832-2224747 or 0832-2225926. Most of the Indians and Foreigners who love natural activity never fails to visit Mollem National Park and they hardly miss this location even though it is quite far from Goa's main city center, Mollem National park has very rare species of fauna, flora, different species, birds and animal life. Mollem National Park assist tourists to stay in outdoor tents within the range and they assist you to set up a campsite to experience and enjoy the nature.